Marvel Comics' sorcerer Supreme, the master of the mystic arts portrayed (like most Marvel characters) in superhero terms. Relatively few know there was also a Doc Strange back in the 1940s — the headliner of Thrilling Comics, published by the outfit variously known as Nedor, Pines, Standard and (the name it was using when Doc debuted) Better Publications. The later Marvel character wasn't the only one Doc might have been confused with. His full name, Dr. Hugo Strange, was also that of a guy who tangled with Batman. But since the villainous Dr. Strange plunged off a cliff to his supposed death just ten months after this one was launched, and wasn't seen again until the 1970s, he can safely be ignored. This Doc Strange began in Thrilling #1, dated February, 1940, which was named after the publisher's successful pulp magazine, Thrilling Wonder Stories. He was created by writer Richard Hughes, later the editor of The American Comics Group (Commander Battle, Herbie) and artist Alexander Kostuk (using the name "Alex Koster"), who has few other credits in comic books. Doc got got to be a superhero by ingesting a substance called Alosun, which he obtained by distilling the atoms of the Sun — tho inasmuch as nobody at the time had ever even gotten as far as Earth orbit, and even today nobody would be able to get close enough to that celestial object to grab any atoms without being vaporized, it seems like the real super feat would be getting hold of them to distill. Nonetheless, he distilled them, and that's what gave him super strength. He didn't keep his identity a secret, hence no mask; and his superhero suit was both minimal (plain red T-shirt and blue jodhpurs, both worn properly skin-tight, plus ordinary belt and boots) and late in coming (it was half a year later, about when he started calling himself Doc instead of Dr., that he adopted the standardized appearance), but he was both super and heroic and that's what qualified him as a member of the genre. He was the only super guy in the first issue, tho he was joined in #2 by The Woman in Red and in #19 by The American Crusader, (no relation) to whom he temporarily lost his cover spot. In #24 (January, 1942), he picked up a kid sidekick called Mike, tho because of his tender years, Mike wasn't allowed to use such drugs as Alosun. Doc never had his own title, but he was popular enough to qualify for a featured position in America's Best Comics, an anthology of the company's biggest characters, alongside Captain Future, The Black Terror and, later, Fighting Yank. In both venues, he hung on longer than most superheroes of the early 1940s, lasting almost to the end of the decade, tho he started faltering in '47. That's when he skipped a few issues of America's Best, and permanently lost the Thrilling cover to a Sheena-inspired white jungle goddess named Princess Pantha. His series ended in Thrilling Comics #65 (April, 1948), tho one last story turned up in America's Best in November of that year. 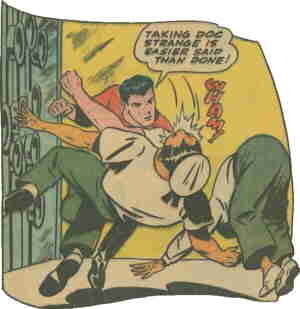 Most of the company's characters have been picked up in recent decades as part of the extra-large superhero universe of AC Comics (Femforce), which specializes in picking up long-defunct characters of this sort — but not, no-doubt because of the similarity of his name with that of a Marvel property, Doc Strange. In 2001, he was pastiched by writer Alan Moore (Miracleman, Swamp Thing) as "Doc Strong", one of several characters in "Terra Obscura", which appeared in Moore's Tom Strong series. Other than that, he's mostly forgotten. Text ©2006-11 Donald D. Markstein. Art © Standard Comics.